The thought of Valentine's Day literally makes me cringe. No really, this year pretty much ruined it for me. 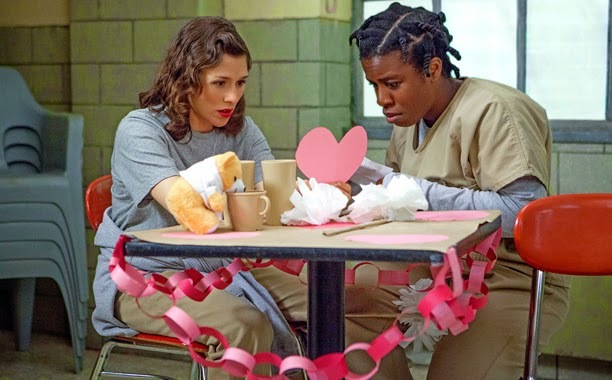 But all bitterness aside (lol) I loved the Valentine's Day episode of Orange is the New Black. Much like the rest of the world, or anyone with Netflix or a Netflix password, I'm breezing through the new season at a pace that will make the year wait for Season 3 that much harder. But I digress. In this episode, much like in a previous post, the main character Piper (although not so much in this season, as there is a lot more attention paid to the rest of the cast's back stories) went around asking the inmates what their definition of love is for a new prison "newsletter." We all have our own interpretations of love and what it means to us, and the responses given were as unique as the characters themselves. Below is one of my favorites from the oh-so adorable Poussey.